(Chris Detrick | The Salt Lake Tribune) Provo Mayor John Curtis celebrates during his election night party at the Provo Marriott Hotel & Conference Center Tuesday, August 15, 2017. Another big batch of ballot results posted Friday did little to change Provo Mayor John Curtis’ already lofty lead in the Republican primary to replace retired Rep. Jason Chaffetz. His claim on the party’s nomination now appears incontestable. 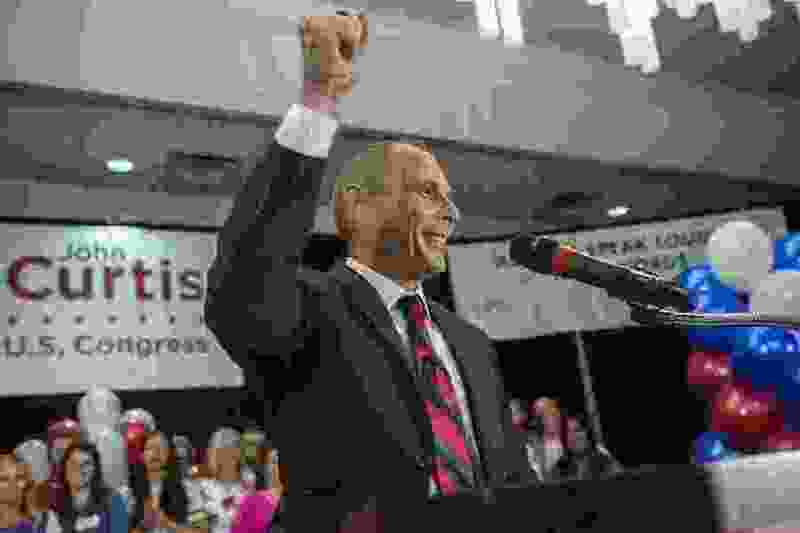 The Associated Press had called the race for Curtis on Tuesday night. But the second-place finisher, former state lawmaker Chris Herrod, had held out hope that the outstanding mail-in ballots could tip the scales in his favor. He conceded Friday when they did not. 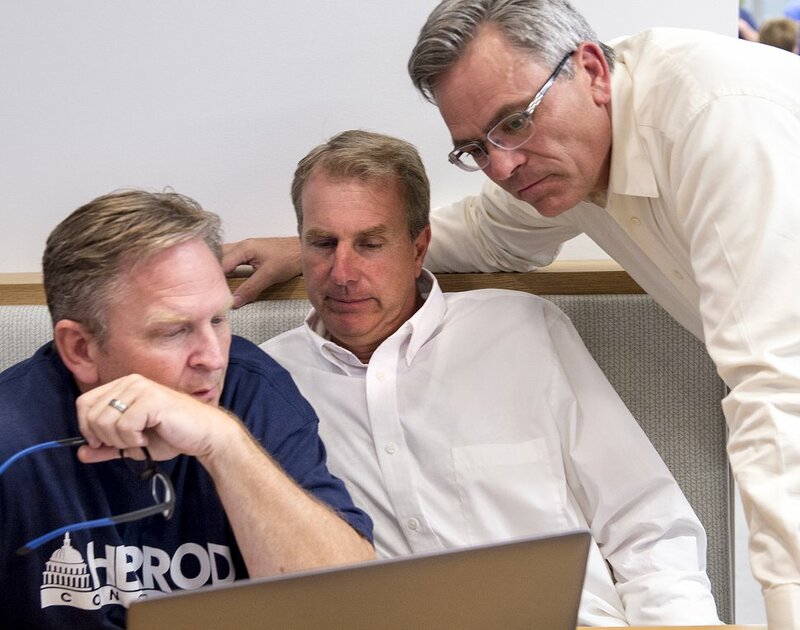 (Leah Hogsten | The Salt Lake Tribune) Former state Rep. Chris Herrod (center) sits between his campaign managers Craig Frank, left, and Ken Sumsion, right, as the three watch the polls Tuesday, August 15, 2017 on election night. Registered Republican voters in the 3rd Congressional District will decide whether Provo Mayor John Curtis, former state Rep. Chris Herrod or businessman Tanner Ainge moves forward to the general election. The winner takes on Democrat Kathie Allen and the United Utah PartyÕs Jim Bennett, as well as a handful of independent and third-party candidates, on Nov. 7. Herrod hoped Republicans who waited until the last minute to vote would have been more likely to pick him, the more conservative of the three candidates. The latest vote count shows that didn’t happen; Herrod performed about the same as he did on primary election day. An additional 18,325 ballots were tallied Friday from Utah County — which includes about 60 percent of the registered Republicans in the 3rd Congressional District. Afterward, Curtis kept a roughly 11 percentage point lead over Herrod in the three-way runoff in which businessman and first-time candidate Tanner Ainge came in third. Curtis went from about 5,000 votes ahead to forging a more than 7,500-vote margin over Herrod, locking in 43 percent of the vote. Ainge fell slightly more behind, dropping from 27 percent to 24.5 percent. He bowed out before 9 p.m. Tuesday. 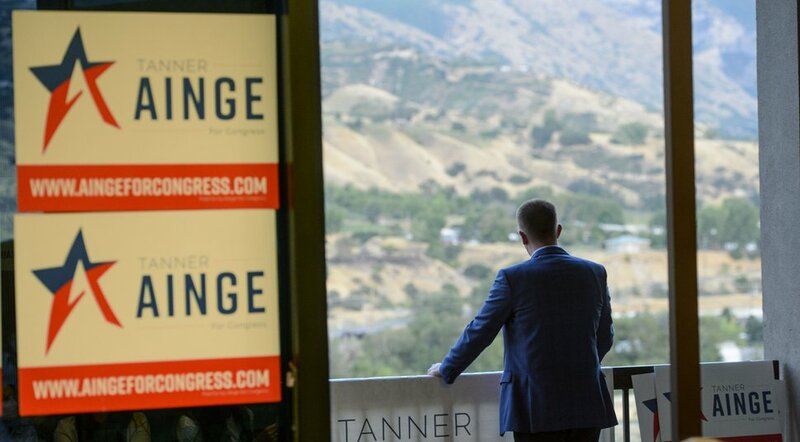 (Steve Griffin | The Salt Lake Tribune) 3rd Congressional District candidateTanner Ainge takes a moment alone as he looks at the Wasatch Mountains outside his election night headquarters in Orem Tuesday August 15, 2017. Early results weren't in Ainge's favor. “I’m glad that our district will have a good leader and a good person like John Curtis,” Ainge said, noting that he’ll return to the private sector. In a phone call with Curtis on Friday, Herrod thanked the mayor and apologized for any delays. He never wanted to be a “sore loser,” Herrod has said, but wanted to be sure every vote counted. The Republican Party, Utah Gov. Gary Herbert and President Donald Trump have already congratulated Curtis on the win. Curtis, mayor of the third largest city in the state (one of the most conservative in the nation), did not vote for Trump in 2016, unlike Herrod and Ainge. He instead wrote in a “good friend’s name.” He also suffered weeks of hounding by his competitors — and attack ads launched by super PACs that cost hundreds of thousands of dollars — for supposedly being too moderate and for being a registered Democrat some 20 years ago. In the reliably red district, where registered Republican voters outnumber registered Democrats nearly 6-to-1, Curtis is a heavy favorite to win the Nov. 7 general election. He faces Democrat Kathie Allen, who’s amassed nearly $700,000, and the new United Utah Party’s Jim Bennett, son of the late three-term Sen. Bob Bennett, as well as a handful of independent and third-party candidates. The winner will serve the final year of Chaffetz’s term after the congressman stepped down on June 30 and has since joined Fox News as a contributor. His early departure turned what would have been a municipal primary only into a congressional special election — the first in Utah in 90 years. The state will certify all results in the congressional primary Aug. 31.